• Electric – no system rate increase. • Water – 18.1 percent increase annually. • Wastewater – 12.4 percent increase annually. During Thursday’s meeting, NewGen’s Tony Georgis revealed to the board that regarding electric services, customers and their respective rates are broken into six classes, including residential and commercial consumers. The current revenue brought in by the entirety of electric consumers is approximately $35.5 million annually. The cost of service study revealed that this revenue is adequate for the coming years; however, some rates might fluctuate between each consumer class, Georgis said. For every class cover their fair share of the total revenue required each year, a. 0.4 percent increase is proposed for residential customers, between 0.9 percent and 6.7 percent decrease in rates for commercial customers and a 69.1 percent increase for customer classes as security lighting services. Actual potential monetary rate increases/decreases are expected to be discussed next month. While the percentage increase for security lighting services is high, it makes up the smallest customer class by a large margin, board members were told. The annual average revenue requirement from 2015 to 2019 is approximately $14.5 million based on the 50/50 debt to cash funding scenario. The current annual revenue recovery for residential is 65.74 percent of the total cost of service, whereas commercial customers are paying about 34.26 percent. The cost of service study results revealed that residential revenue recovery should be responsible for 66.26 percent of the bill, whereas commercial should be responsible for 33.74 percent. If the system were to remain as it is, this would mean the commercial class is slightly subsidizing the residential class, to the tune of approximately $75,000 annually. The annual average revenue requirement from 2015 to 2019 is approximately $6.1 million for wastewater costs. Residential customers are currently responsible for 63.2 percent of the revenue brought in, whereas commercial customers are responsible for 36.8 percent. Commercial is subject to subsidizing residential again, as residential should be responsible for 64.2 percents, whereas commercial should be responsible for 35.8 percent, according to the study. This subsidy approximates to $62,000 annually. Board member Howard McClurkin expressed his displeasure with this notion. “It’s a dangerous thing to keep these subsidies in place,” he said. McClurkin expressed concern that the subsidies could snowball over time. The board agreed and said they wanted the subsidies eliminated as the rates are designed. The actual potential rate changes are expected to be determined next month. At the end of the presentation, NewGen’s Chris Ekrut addressed the economic hardships rate increases could have on certain customers. One of the options he suggested to help levy this was a third party program called Round Up. This program would essentially round up customers’ bills to the nearest dollar. The change from each round up would be put into a fund that could in turn be used to help those with legitimate needs. The council asked that the option be looked into further. highly detrimental to range conditions and causes irreparable damage to pasture land. Yet we have 425 parcels under 1.0 acres with an ag. exemption, some within city limits. Almost as much as the entire revenue collected without a tax increase for every land owner in Parker County. 19 Counties have instituted requirements to eliminate this brand of tax fraud, and we should too. The revenue to eliminate higher rates is there somewhere, just do the research and think outside the box so to speak. Just because you have done things a certain way for 30 to 40 years doesn’t mean it is the best way to do it. Gather together a citizens’ group to brainstorm this problem and come up with a workable alternative to additional cost to citizens. That is what I am doing and unlike most of you, I am willing to help solve your problem. Just ask. It might also be productive to contact some of the metroplex TV station investigative reporters, who like to delve in to cronyism and favoritism. 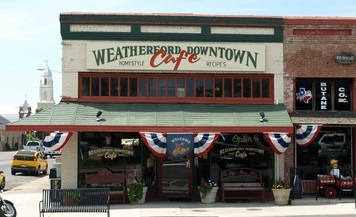 We, the taxpayers of Weatherford, have a City Council and Utility Board that is OUT OF CONTROL!!!! They need to be replaced. Both think the City of Weatherford is their own personal business and think it is to make a profit, in the case of government run operations a “slush fund” that they control out of sight of the taxpayers. As part of an ongoing discussion, the City of Weatherford Municipal Utilities Board Thursday was taken through part two of the rate-making process for the city’s proposed capital improvement plan. Is not a utility to serve the public? Rates should be set by taking what it cost to aquire the raw materials, process them plus the cost of administration. No where should we have funds in case we have a disaster that requires major repairs or estimated cost of capital improvements. Paying for this study and the company that made it seem to be a WASTE of taxpayers monies.